Facial expressiveness can be defined as a space of all possible facial expressions. The Varieties explores face space by enumeration of all possible facial muscle contraction patterns. Our research showed that 6 muscle on/off contraction states on each side of the face produced clearly discernible expressions. 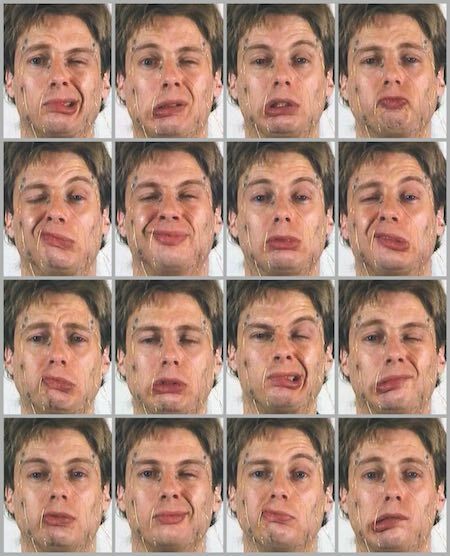 This defines face space as having 4096 (212)* possible facial expressions. In the video registration a simple visualization of binary counting up from 0 to 4095 shows in rapid succession all the expressions on Elsenaar’s face. It is interesting to note that the facial hardware allows for a very rich set of expressions, but humans mostly appear to use a rather limited subset. Sound is produced by the actual electric impulses entering the body. * Technically the procerus muscle could be added expanding face space to 8192 (213) possible expressions.